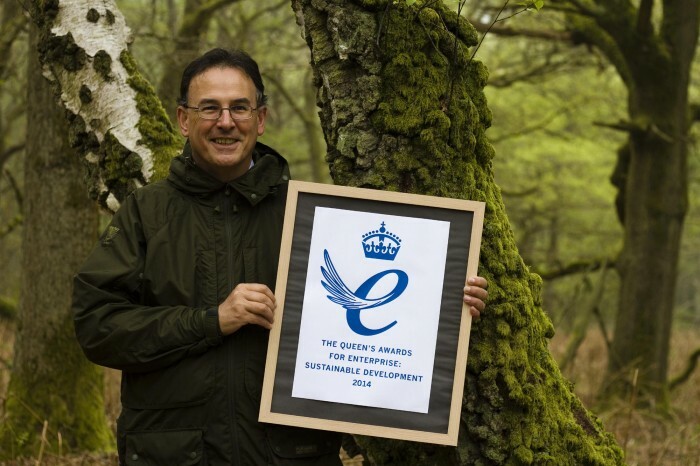 Nikwax has today received a Queen’s Award for Enterprise in Sustainable Development. The award is the UK’s highest accolade for business success and celebrates the consistent development of products and approaches to management that are commercially successful and have major benefits for the environment, society and British economy. If you’ve ever noticed your coat soaking up water in a rainstorm and you feel cold and clammy, you’re a potential Nikwax customer. Nikwax manufactures water-based waterproofing solutions that revive the waterproofing performance of outdoor clothing such as rain jackets and walking boots. Our products offer an easy way of restoring the performance of your rain jacket in a washing machine at home, by running a normal cycle and using Nikwax TX.Direct in place of washing powder. In contrast to industry norm, Nikwax is the only established water proofing aftercare business in the world never to have used aerosols or perfluorinated compounds (PFCs). The whole Nikwax range is non-flammable and is free of the harmful raw materials commonly used in the waterproofing of outdoor clothing. We have always identified environmental and social responsibility as a priority. From the company’s inception in 1977, Nikwax has been driven by the passion and commitment of founder and current Managing Director, Nick Brown, to protect our outdoor surroundings. Nikwax has a stringent restricted chemicals policy that prohibits the use of flammable and aromatic solvents and potentially persistent materials – chemicals widely used by other companies producing water repellent treatments. We have continuously campaigned against the use of PFCs, knowing that these chemicals persist in the environment, can bioaccumulate and are linked to serious negative health impacts. PFCs have been linked to serious negative health impacts such as damage to the immune systems of children, compromised female fertility and an increased incidence of cancer. For more information on this please see our environmental pages here. For over 35 years Nikwax has been developing alternative waterproofing solutions, and our products – such as market leading TX.Direct – have consistently been shown to outperform the competition, both practically and commercially. Nick’s determination to avoid aerosols could have posed a risk to the business at a time when going green was against the grain, but the challenge to produce innovative solutions has allowed Nikwax to constantly sit at the forefront of waterproofing technology. To deliver sustainable processes, Nikwax harvests rainwater for use in the manufacture of our core products, has invested in a solar generation system that virtually provides the entire electrical usage of its main office unit, and is carbon balanced though the World Land Trust, matching all offsetting donations with an annual donation to preserve standing rainforest. Our waste reduction initiative has seen the company’s proportion of waste recycled go from 16% in 2006 to 71% in 2013, with a target this year of 80% and a five year goal to become waste and landfill free. This award is testament to our continued commitment to sustainable development over many years, but for us it doesn’t stop there. Nick said: “Taking the ethical route rather than the easy-money road is a difficult decision for some, but the minimising our environmental impact was always the way for me. I feel immense pride when I see our product on the high street and know they are going some way to preserving the environment around us – it’s a win for the customer and conservation. The Queen’s Award is a great endorsement that says, yes, you’re doing alright, keep going”.